It almost closed in its first year. But now, 20 years on, the owner of Birmingham’s first comedy club is laughing all the way to the bank. Mark Tughan took a risk when he opened The Glee Club back in 1994 and it struggled initially. But now he owns four comedy clubs across the country and a business with a turnover of £3 million. He even won a David and Goliath legal battle to protect his company’s name from media giants 20th Century Fox and their TV show Glee. Mark’s success is hard won, which is why he is so scathing of new venues trying to muscle in on the burgeoning comedy scene. He thinks little of pubs and clubs who decide to “stick a bit of comedy on” without thinking it through. In May, comic Jason Manford launched Manford’s Comedy Club in Players Bar on Broad Street, while gentleman’s club The Rocket, in what was Ronnie Scott’s, launches its first night at The Rocket Comedy Club on September 19. “I call them the pop-up banner brigade,” says Mark, 46. “They put up a banner, book a few comedians, stick two speakers in front of a wooden stage and suddenly they’re a comedy club. But that’s not enough! “For them it’s all about increasing drink sales, not about the laughter and customer experience. “For example, I employ someone just to make sure the sound and lighting is right. Anything else is cutting corners. “I’m responsible for everything in my club, from the state of the toilets to the quality of the food and the entertainment. Mark opened the doors of The Glee Club on September 10, 1994. Born and raised in County Down, Northern Ireland, Mark took a year out at 18 to work at various jobs in London. “I was introduced to the original Comedy Store in 1986,” he remembers. “That’s when Ben Elton was compering in his sparkly suit and Harry Enfield was headlining as Stavros. “You used to queue for a couple of hours to get in – there was no internet and advance booking then, you just joined a queue. “Something clicked in my psyche and I was absolutely hooked. I could see something was changing and I wanted to be part of it. “I went to Nottingham University and then into banking. “I really started Glee to escape the City during the last recession. “I could see the way things were going. When I joined a merchant bank as a graduate trainee, there were 35 of us. There were four when I left. “I had had a rotten few years in the City, and one Monday morning, after not sleeping a wink, I thought ‘I can’t do this any more’. So I resigned. “I’ve always wanted to open a comedy club, though I thought I would probably go back to the world of high finance after a couple of years. “I really didn’t expect to still be here, 20 years on! “It was a good time to do something fairly nuts as I was young, with no family or commitments. “I was out one night and got chatting to a property surveyor at the bar, I had a rush of blood to the head and said ‘Do any sites exist outside London for a comedy club?’. “I wanted somewhere that was cheap to rent, with a room the right size and shape with low ceilings and no pillars. “He rang me a couple of days later saying he had found some space in the Arcadian in Birmingham. “I didn’t know the city but the UK’s second city seemed a good place to set up. “I wasn’t the first to try comedy in Birmingham but we were the first purpose-built comedy club rather than a room above a pub. “It was tough for the first year and after nine months I really thought we might have to close. “We had pretty tiny audiences. Comics were used to playing to 20 people in a pub, but that wasn’t commercial for us. “There was a bit of a panic. I had to go back to my original backers and tell them the cupboard was bare and we needed more money. “I had started the business with £100,000, borrowed from friends and family and two angels. But they got back five times what they invested. “In the second year we started to fill up. We improved our marketing and moved the bar further from the stage and shut it when the acts were on. “I had a fierce debate about that with my manager, but he was right. It stops chit-chat and noise from the bar and it didn’t harm drink sales – people just get their drinks in first. The Glee has been a success not just in financial terms, but in helping to launch the careers of top comedians. “People come to see stars before they become famous, and they then remember us. We are the venue of choice for acts to warm up their show before a tour. We get people like John Bishop, Lee Evans and Michael McIntyre doing last-minute secret gigs. “We once had an Edinburgh preview show that didn’t sell out that had John Bishop and Kevin Bridges as unknowns. “One Christmas show had John Bishop and Michael McIntyre on the same night. “Jack Dee, Peter Kay, Lee Mack and Ross Noble appeared at the Glee when they were starting out. “They remember us. Sarah Millican came back to do a Rough Works night for new material and we paid her in scones. “Ross Noble asked to compere our 20th anniversary show next week. “Mind you, it doesn’t always go well. My worst moment was at the VIP opening of the Cardiff Glee Club in 2001, when headliner Mark Lamarr took against a bit of good-natured heckling, put the microphone down and walked off stage. “It was the longest 10 minutes of my life. “A lot of comedians say the Glee is a good room because we make it hard for them to die. If they die, it’s their fault. “The theatre lay-out is important – customers should be facing the stage. “It helps if people are squished a bit together, rather than with their backs turns to the rest of the audience. That communal laughter experience really helps. “I like the size of the room. I will never go to see someone in an arena as I think it rarely works. The acts are too far away, you might as well be watching them on TV. “Snobs is the only other night spot that’s been going longer than us in the city centre. “I describe Glee as nightclubbing for grown-ups. When you get to my age you’re beyond clubbing, you want a night out but you want to sit down and be heard. The Glee’s first major competition came in 2003, when Jongleurs comedy club opened in Broad Street. “My instinct is to fight and raise my game, so when I heard Jongleurs was coming, I shut the club for a few months for a major refurbishment. “We were outgrowing our space so we doubled in size, opening up the downstairs bar and studio so we could have two shows on a Saturday night. 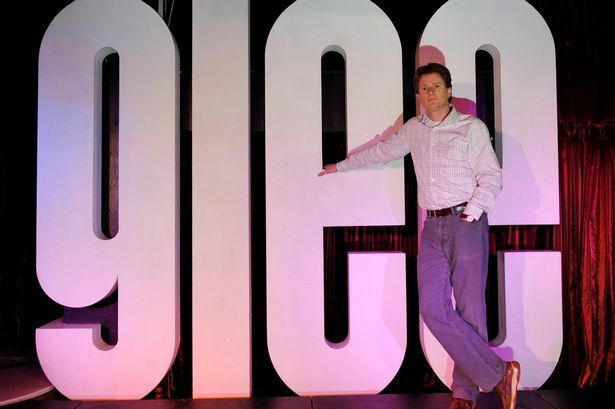 Mark opened his Cardiff Glee Club in 2001 and clubs in Nottingham and Oxford in 2010. It was during the latter expansion that he really noticed the effect of the TV show Glee, about a singing club at an American school. “I felt the launch of both these clubs was compromised, if not entirely neutered, by this global TV phenomenon,” sighs Mark. “We were bombarded with people who assumed we were the TV show. “We were well established in Birmingham so it wasn’t as pronounced here, but when you’re trying to launch something new and call it Glee, everyone thought we were something to do with the TV show. “I felt I had to fight them, as I had trademarked the name back in 1999. It took a very long time and has cost many hundreds of thousands of pounds in legal fees, but I hope to get at least some of that back now a judge has found in my favour. Mark spent 14 years living in Moseley but for the last six he has been in Barnt Green, raising two children – four-year-old Anna and Thomas, three – with his wife, solicitor Samantha. They met at the Glee when she came to learn Ceroc dancing, a class Mark used to put on on Monday nights. He admits he works fewer hours now and has learned to delegate more. “I have an accountant now. I used to do all the books myself, writing them up in pencil. “I even designed our website and ticketing system myself with a schoolfriend. It’s all ours, we don’t use any outside ticketing agents. “Everything is in-house, nothing is out-sourced. “Almost everyone I employ is on a profit-related pay system, so if we do well, they get a bonus. Mark has owned 100 per cent of the business since 2000, despite offers from private equity to invest. “I don’t want to be answerable to outsiders, and they’d want to expand to 50 clubs, which is never going to happen. I may open one or two more clubs, but comedy clubs can never be chains. They’re not like Pizza Expresses, local conditions really count.